I think we can officially say, barring any injury, that the Brian Hoyer era is over for good in San Francisco. It was not fun while it lasted. He was never going to be the long-term solution at quarterback, despite knowing the system, due to his glaring flaws as a passer. According to the Fox Sports broadcasters on Sunday, head coach Kyle Shanahan has been searching for the right time to insert rookie third-round draft pick C.J. Beathard into the starting rotation. He found his opportunity midway through the second quarter last Sunday against the Redskins. Hoyer was benched Sunday after a shaky start and largely abysmal performances through five weeks. He was 4 of 11 for 34 yards on Sunday and likely finishes 2017 with a 58% completion percentage, four touchdowns, and four interceptions. The rookie came in halfway through the second quarter and played about as well as you can expect a third-round compensatory selection to play. He made some really nice throws, made some really boneheaded throws, and brought the team within two points of the Redskins and a chance to win the game. The hype is a bit unwarranted, and I don't think we're sitting here praising him for his play if not for a defense that got the offense the ball back at the Washington one-yard line. Still, there's vastly more to like about Beathard's performance over half of a game than Hoyer's five-and-half games and there's reason to believe he will provide the spark going forward that will continue to make the 49ers competitive and win some games. Through five weeks, I was adamant about at least sticking with Hoyer, possibly through the end of the season or until it just became so apparent that he needed to be benched. For me, at least, my patience grew thin from Week 5 to Week 6 and miss after miss after miss on Sunday forced me to acknowledge that his time was probably over. I was lukewarm on Beathard after the draft and thought he displayed enough traits to be a viable starter with two to three years of development. He didn't receive a lot of praise during the draft and didn't flash against second- and third-team defenses, making it hard for me to justify the "let's just see what he has mentally." On Sunday, though, Beathard displayed an ability to throw with anticipation, accuracy and an ability to understand defender leverage, and good pocket navigation. Despite that, he still needs to clean up his decision making and pocket awareness. There's enough there to be confident he can make the team more competitive going forward. One of the most underrated aspects of Beathard coming out of college was his arm talent and anticipation. He doesn't have a strong arm, but he can hit small windows with good anticipation and timing, an important factor in Shanahan's offense. He could seemingly make throws to all levels of the field and this game was no different. He was able to push the ball downfield as well as fit throws into some tight spaces, controlling the velocity and trajectory in a way that inhibited the defense from reacting. 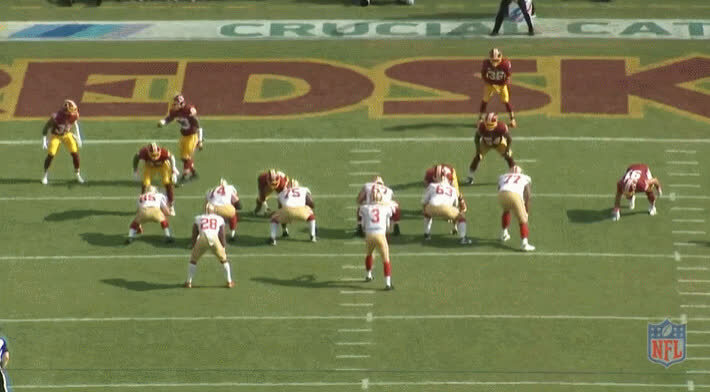 On this play, the 49ers in 11 personnel (one running back, one tight end, three wide receivers), are running a slant/flat combo to both sides against the Redskins cover-3 shell. With the deep safety retreating into the deep middle third of the field, Beathard then gets the linebackers to move slightly out his throwing lane with his look-off to the right. This opens up just enough space behind the linebacker for receiver Marquise Goodwin to run to. Beathard snaps back and rifles a pass out of reach of the underneath defenders that Goodwin hauls down in front of the corner covering him. Beathard showed the confidence he has in his ability to make tight window throws on this play, which he often did across the middle in college. If Beathard can rifle a perfect 20 yard pass into tight coverage, then he can certainly drive the ball downfield with some nice touch. At the snap, receiver Trent Taylor draws the attention of both the underneath defenders shaded over him and tight end George Kittle. With their eyes focused on Taylor, Kittle runs right by the defenders down the seam. As soon as Beathard notices this lapse in coverage, he throws on time over the middle to hit Kittle, who's in behind the underneath coverage. The trajectory of the pass shows that Beathard understands leverage of defenders in coverage and the placement of the pass prevents it from being batted down. Beathard arm talent allows him to lay it in perfectly between a triangle of defenders that prevents Kittle from getting crushed but also allows him to turn and keep stride. One of the areas where Beathard needs to improve is pocket awareness, but he already shows that he has the tools to effectively work from a muddy pocket and outside the structure of the play when needed. The touchdown in the fourth quarter to Aldrick Robinson illustrates this trait quite nicely. After a blown coverage, Beathard hits Robinson down the sideline for a 45-yard touchdown. It's a play we've seen Hoyer miss all season because he does not see the open receivers all that well. The Redskins again blow their coverage assignment and it proves costly, this time with the nickel defender and the corner both sitting on Trent Taylor's route. This allows Robinson to get a free release up the seam. Meanwhile, Beathard eludes pressure by stepping up in the pocket and delivering a strike to Robinson downfield. Beathard never takes his eyes off his target, even as he begins to scramble. He throws on the run and leads Robinson to the outside away from the safety coming over the top. It's a play very few rookie quarterbacks can make with such fluidity. NFL quarterbacks are often praised for their willingness to stand tall in the pocket and take hits while throwing the ball. But that can often be a detriment to a young quarterback who doesn't often have a good feel for the pocket. While Beathard does display an ability to make throws from the pocket, he often did so while not adequately feeling the rush around him. There were many times in college and last week where he simply rushed his process in a clean pocket. Perhaps it's just a lack of confidence that he can overcome with more consistent time to throw and not chasing a lead. But on this play, there was no need to rush a throw from a clean pocket. He should have stepped into his pass and he probably would've had Kittle for a touchdown. Instead, the pass sails with too much air under it and Kittle can barely get his outstretched hand on it. Beathard threw five passes that should have been picked for interceptions but the defenders were not able to hold on to them and they were largely the result of poor decision making and not knowing when to throw within the timing of the play. On this particular play, Beathard is throwing a three-step drop pass to a five-yard out route (in fact, he struggled the entire second half throwing out routes to the sidelines). It's a time route that requires the quarterback to drop back three steps, plant, and throw. Instead, he hesitates just enough at the top of his drop that it gives the defender time to jump the route. That ball should be out while the receiver is making his out cut, instead, it comes out just after he makes his out cut. Overall, Beathard's performance wasn't really anything to hype, but given the level of quarterback play from Brian Hoyer since Week 1, it is a welcome relief to see the offense move a bit more efficiently and it allows Shanahan to evaluate the position heading into the offseason, during which the team will have a plethora of options in the draft or free agency. After the game, Shanahan said "I think he gives us the best chance to win going forward. … I was excited about how he played." He certainly does, and it should be exciting to watch as Beathard makes his first NFL start against the Dallas Cowboys in Santa Clara. Comment: Good article rich. I agree, he does need to step into his throws more. Needs his outer foot more out in front of him and he'll have a much easier time. But he has undoubtedly displayed more in 1 game, as a rookie, than Hoyer through over 5. We'll see how this plays out. Should be an interesting offseason.